Read part I of the guide here. Now that you’ve got your market alt created, skilled, and docked in the station you’ve chosen at your home, it’s time to get down to the nitty gritty of trading. A good program to use for identifying items is Evernus. It’s an amazing program with a lot of cool features that would require a whole separate guide. Even without the aid of software, it is still pretty straightforward to find an item to trade. First, open your market browser. Open up the Ship Equipment category to start and navigate to your favorite type of module. In this example, I’ll use shield extenders to demonstrate how to choose an item. 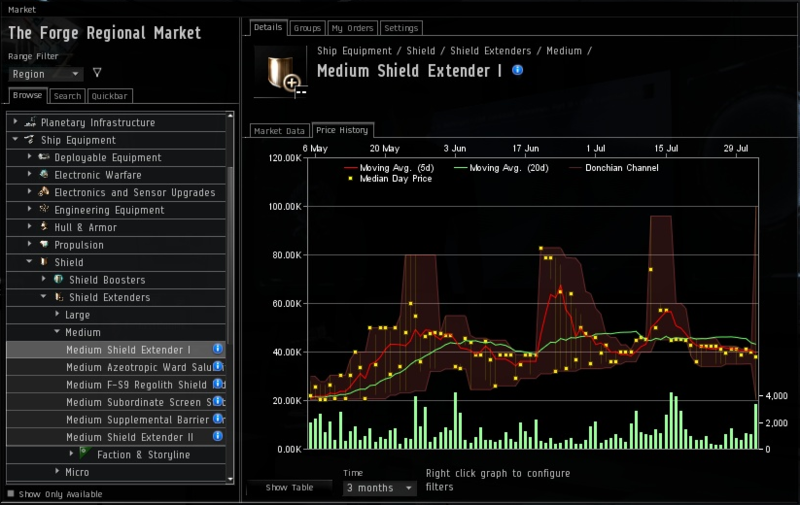 This is the market page for Medium Shield Extender I. Looking at this page, we can see that the current highest buy order in the station (because remember, this is station trading, we want to only deal with items and orders in this station. 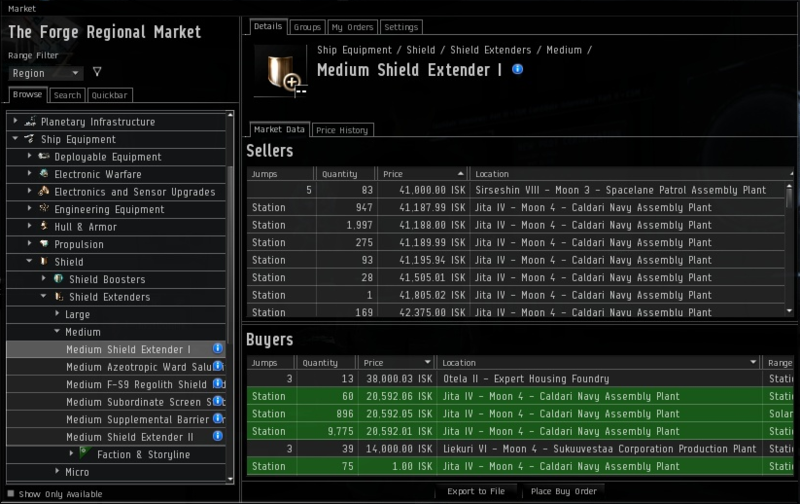 I don’t want to be running around collecting loot at all) is 20,592.06 ISK, and the lowest sell order is 41,187.99 ISK. This means that for every unit of this item I buy through a buy order and then sell through a sell order, I’ll be almost doubling my ISK (after taxes). Sounds great and all, but keep in mind that this item is very low value. At 20k ISK a unit, I won’t be making billions off of this item alone. Because of the amount of ISK I have, I have decided that I do not want to trade this item, as I can trade other higher value items in higher volumes to make more ISK with my order. However, for the purposes of this guide, I will demonstrate my process with this item. What we can see from this screen is that the profit margin on this item is about 100%. This means that when I make a buy order for the item and then sell it through sell orders, I will be making a profit of 100% on my investment. Next, we click on the Price History tab towards the top. This screen shows the 3 month price history of the item. From this chart we can tell quite a few things. First I will break down what each part of the graph means. Put on your thinking hats and get ready for some SCIENCE! The red line represents the 5 day average. The green line represents the 20 day average. The yellow dots and red silhouette represent the volatility of the item. The narrower the silhouette is, the less volatile the price of the item is. The green bars on the bottom represent the volume of the item being moved every day. Now let’s analyze this graph. Take a look at the red line. It seems to be spiking in some areas. However, the green line is mostly stable. The areas where the item’s price spikes are the areas in which the silhouette is the widest. This could indicate that the spikes are caused by market anomalies, while the price for the item seems mostly steady. Now looking at the bars on the bottom of the graph we can see that an average of 2,000 units are moving through the market every day in this region. That’s a possible 2,000 * 20,000 = 40 million ISK profit every day, if your orders are ALWAYS on top. If you have a life, this is very unlikely; expect much less from the item. However, it is obvious that there is ISK to be made. What I look for when choosing an item is a good profit margin (>30%) and a good volume being moved every day, along with a steady price line. This meets all of the above. Before making an order, I want to add the item to the market quickbar. This is a list of my “favorite” items on the market that makes it easier to manage my orders. By adding the item to the list, I won’t have to navigate through so many market menus to see it, all I have to do is click on the quickbar tab in the left pane of the market window. For those of you who would like to go more in depth into choosing an item, I recommend reading this article from E-UNI. It’s a method called the Bullworth Burger. Now lets go ahead and make a buy order. Here are the settings I use for my buy orders. I set the price to 0.01 ISK higher than the highest buy order in my view that has a green bar on it (green bar means they can buy items in Jita. This means that green bar = competition). I set the minimum quantity to 1, the duration to 3 months, and the range to the current station (like I said, I don’t want to do any hauling). It would be a good idea to tick Remember Settings now so that you won’t have to modify those portions of the order window when next you choose to make an order. As for the quantity, I choose a number that is less than or equal to the daily average of how many of the item move through the market. If the item is expensive, I limit my orders to a max of around 200 million ISK; otherwise, my quantity usually matches the daily average. As my buy order begins to fill, I make a sell order. Generally, I will start selling items as the estimated value of the stack approaches or exceeds 5 million ISK. Now that I’ve made my buy order, all there is to do is to wait for it to start filling. Every so often, I will have to update my orders to make sure that mine are on top. To do this, open up your wallet and hit the orders tab. Double click an item in the tab to open it in the market window. To make it easier to manage your orders, open up the market window and hit the settings tab at the top. Check the option labeled mark my orders. Now open an item you have an order on in the market window. The orders with blue bars around them are yours. If your order is not the highest buy or lowest sell order, click on your wallet and right click the order. Click modify order. Change the value of the order to 0.01 ISK above the highest buy order or below the lowest sell order to make sure your order is the one that’s moving product. It costs 100 ISK to change an order and it can only be done once every five minutes for each order. If you keep on top of your orders and make sure that you’re currently leading the market, you can sit back and watch the ISK roll in. The same as With mission running you also have to take your time spent to gain isk in mind, if you babysit your buy orders but only make a 100 mil profit over 4 hours then you might as well run missions. Key to this Strategy is playing into the hands of the weekly and period fluctuations of the market you bought into. Take the shield extender example, its price changes has a 25% bump every couple weeks and has a small fluctuation upon the weekly cycles (meaning the difference in player activity and ships destroyed over the course of a week). Thought this item will most likely only be influenced by supply rather then changes in demand due to its meta 1 status. To cash in on this drift your better off in markets like manufacturing materials, LP rewards and frequently used modules. As player activity rises during the weekend, so does the supply in remote areas, while manufacturers buy in bulk in jita and haulers sell in bulk at the same time. Managing the difference between buy and sell price at these moments can yeild some good results but dont require a lot of updating your buy orders. Simply wait a few hours and the next missioner or freighter comes in and fills your orders and the 5 above yours. While the demand for modules increases somewhat due to the increased activity of combat. What now? Learn how to grow your trading empire. If I buy from that Sell-Order and sell to that Buy-Order, i LOOSE 50%, not make 100% (plus/minus taxes). I would have to find a Buy-Order that pays more then the lowest Sell-Order wants as payment. When Buy-Orders and Sell-Orders overlap in the set price, are they resolved automaticly? Find an item, where there are some items at a low price, the next bunch of the same items at a considerate higher price. Buy the low price items (only works if i can buy them all), set up Sell-Orders undercutting the now lowest price. In case of EVE, there is the alternative to find a station where stuff is sold lower then Buy-Orders are in another place and transport that wares. Hi Nina! You’re thinking about this process backwards. When it comes to station trading, patience is the name of the game. When someone sells an item to a buy order, or buys from a sell order, it’s because they’re impatient. They want the item NOW and they’re willing to pay a little extra to get it. Meanwhile, you play the long game. You make a buy order for 20k ISK, and when someone impatient comes along and sells the item to a buy order, you buy it for 20k ISK. Then, you make a sell order for that item at 40k ISK. When someone impatient comes along and buys the item from a sell order, you sell it for 40k ISK. You make a profit of 20k ISK (minus fees), and you have 2 satisfied, impatient customers.